Every year, the McGill University Faculty of Law Centre for Human Rights and Legal Pluralism sends a select group of students to locations around the world to conduct legal work on human rights and development as part of a 12 week internship. Students work on various topics ranging from women’s rights to piracy to aboriginal law (among others). This is the first year in which an intern from McGill was placed at CEHURD’s office in Kampala, Uganda. I joined the CEHURD team as part of the McGill Human Rights Internship Program in May and the experience has been transformative. During the first portion of my internship, I worked closely with Primah Kwagala, the program Manager for the Human Rights Documentation and Advocacy Program. I arrived at a particularly exciting time and worked closely on the TRIPS (Trade Related Aspects of Intellectual Property Rights) advocacy work. This particular project led me to meetings at Parliament, proposing the passing of a resolution by the East African Legislative Assembly, and presenting the civil society position to the TRIPS Council representatives at the Ugandan Ministry of Trade. As I became more familiar with the work and city, I quickly learned that there is never a dull day at the CEHURD office. Mid-way through my internship, I also began to working with the Community Empowerment Initiative where I visited tobacco farms in Kiboga and consulted with community members. During our consultations and interviews, we quickly learned about the complex connection between Tuberculosis (TB), Human Immunodeficiency Virus (HIV) and tobacco. Tobacco smoking, a modifiable risk factor, is associated with poorer outcomes in HIV-associated opportunistic infections, of which TB is the commonest in developing countries, including Uganda. These connections are rendered even more complex once the involvement of business incentives vis-à-vis farming practices are introduced into the equation. The trip to Kiboga was enlightening on many levels. Even the car ride to the district with CEHURD’s Executive Director, Mr. Moses Mulumba, proved to be an enriching opportunity to experience life outside of the hustle and bustle of Kampala. Mere kilometers outside of the city centre, I felt transported to a different way of life; hoards of children walked barefoot to school, farmers lived communally on tobacco farms to sustain operations, and HIV clinics were grappling to figure out effective strategies to deal with TB co-infection. 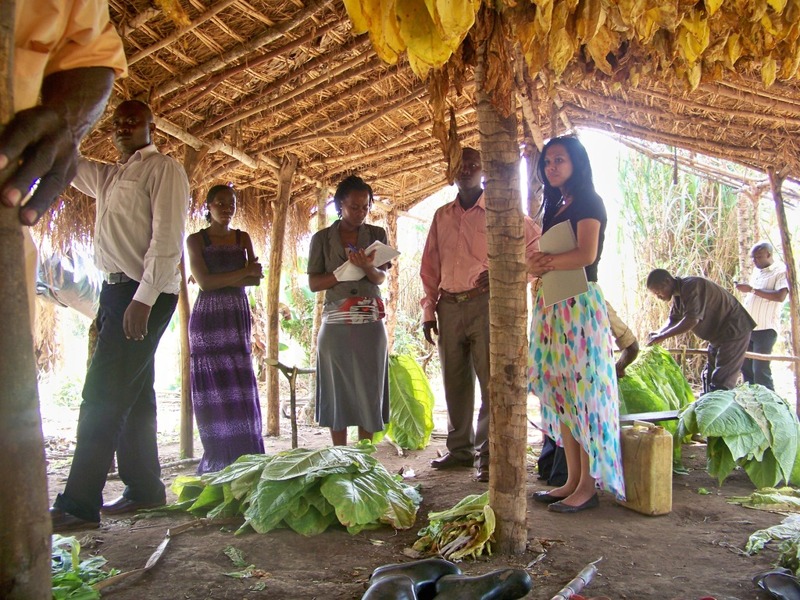 Now, I will be using what I’ve learned to draft grant proposals so that CEHURD can continue to conduct research and advocacy in the area of tobacco control, particularly among vulnerable populations like the ones we met in Kigoba. Overall, my term at CEHURD has been unparalleled. I’ve learned a great deal, discovered a passion for health and intellectual property law issues, and made some great friends. The CEHURD staffs have been overwhelmingly welcoming and have grown to be great mentors for me. I would like to extend my deepest gratitude to everyone at CEHURD for a wonderful summer and for providing me with the knowledge, experiences, and tools to move forward and continue to advocate for the right to health. While I arrived in Kampala as a timid second year law student in May, I will be leaving as an advocate with a passion for advancing for the justiciability of the right to health. Wabale nyo, CEHURD!